If you are looking to upgrade your home with any of the many electrical additions or installations available today, you've come to the right place. Ampacity Electric does not engage in the practice of "Get in their door and charge them more". With Ampacity Electric you will always know the price up front, work will never begin before a written estimate is agreed upon. Ampacity Electric offers free estimates on electrical work. In reality, we only call it an "estimate" because that is the common industry terminology. In actuality, we provide a written quote with a guaranteed price for the job. 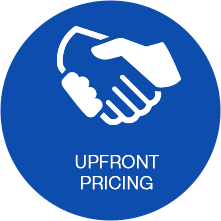 We provide flat rate & consistent up front pricing so you are never left guessing. We always quote you the full price of the job. No hidden charges, no overcharges, and never "It took longer than we expected, it's going to cost you $___ more". Have you been thinking about adding a backup generator? A new addition? A new electric panel or service upgrade? We do it all, call us for your free estimate today. Ampacity Electric is a licensed electrical contractor in the state of New Jersey. We are insured and bonded and we offer a lifetime warranty on labor. We respect your time, we are always on time and finish your project on schedule.